Michael Metcalfe shares a shocking idea at TED@StateStreet: printing money to ensure we meet our goals for global aid. “What corporate management team doesn’t say that they’re open to innovation?” says Michael Metcalfe, the senior managing director of State Street, the financial institution based in Boston. In November, Metcalfe saw his company do something concrete about building a culture of openness among employees and sharing ideas across the organization. He found himself onstage in front of 350 of his colleagues at TED@StateStreet, delivering a talk on a daring idea: Governments should print money for aid to other nations. 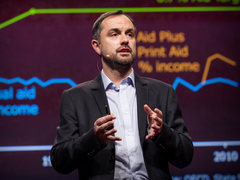 His talk, “We need money for aid, so let’s print it,” was published today on TED.com. Michael Metcalfe: We need money for aid. So let’s print it. Metcalfe was one of 12 State Street employees, from all levels of the company, who delivered talks at TED@StateStreet, one of our TED Institute events, a TED-curated program that unlocks good ideas from inside our partner organizations. At TED@StateStreet, themed “Forces of Change,” graphic designer Joe Kowan serenaded the audience and shared his foolproof method for beating stage fright. State Street’s chief analytics officer, Roger Stein, talked about mitigating risk in unexpected situations in his talk, “A bold new way to fund drug research.” And information security manager David Grady brought to life the corporate epidemic of overcrowded meetings with a wry sense of humor — and shared what can be done about it. Building a culture of innovation is an important aspiration, especially given a recent Gallup poll that found that two-thirds of employees feel dispirited and disengaged at work. While stale attempts to boost employee engagement can leave people feeling cynical, authentic ones can reinvigorate a sense of mission in the workplace. Alison Quirk, State Street’s Chief Human Resources Officer who also spoke at TED@StateStreet, lays it out this way: “We think about employee engagement in two ways: rational commitment and emotional commitment.” If someone feels like the company is good for their career, they are rationally committed. But emotionally committed employees feel that their work contributes to a shared higher purpose. These employees are more likely to pursue new ideas and they tend to be more productive. Their intellectual buzz attracts more talent to the company. State Street hopes that conversations like these – between departments and across organization levels – will lead to fresh thinking. After all, a company is more than just 29,0000 employees; it’s thousands of people with individual stories to tell. Metcalfe’s talk, isn’t available among those on the linked page, so it’s hard to judge whether he has a new take on this issue. On face value, he hasn’t learned (or ignores) the lessons of history in suggesting that printing money is an answer to financial problems. It is an idea that usually emanates from the far, conservative Right. Again and again, such exercises have done little more than bring on hyperinflation as an oversupply of hard currency drives down value. It is an historical lesson already learned many times, and I’m surprised to hear it rear its head once more.